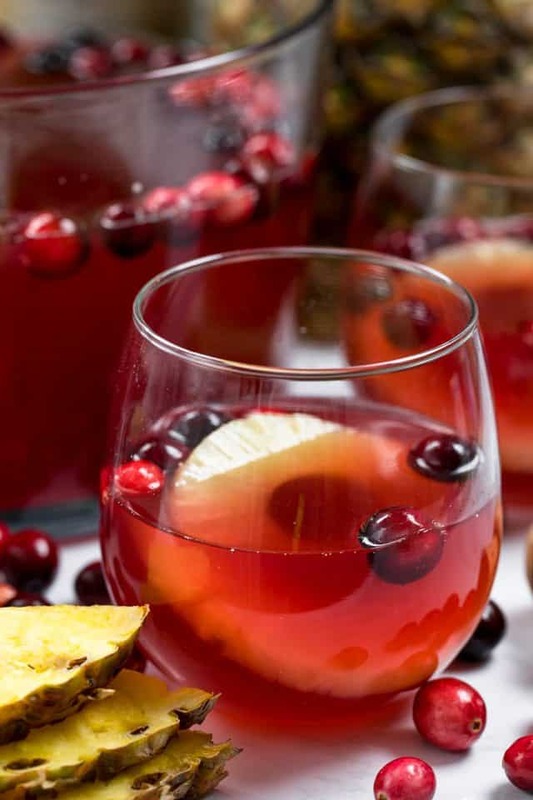 Cranberry Champagne Punch is the perfect holiday drink! 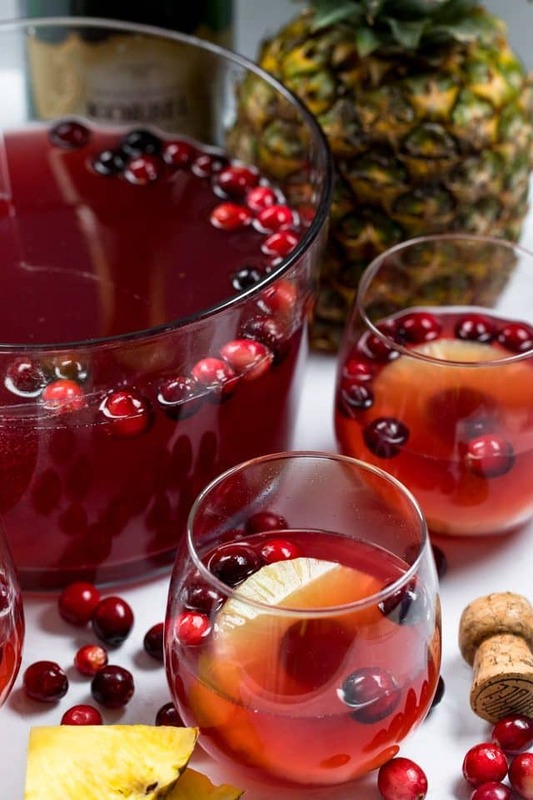 Champagne with cranberry, pineapple, and vodka makes a punch that tastes like juice. Merry Christmas, lol. 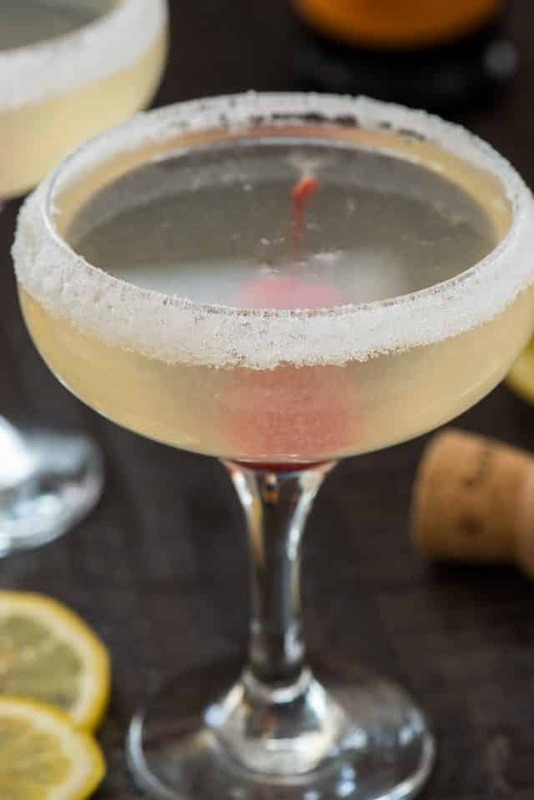 Are you looking for a new cocktail to serve this holiday season? This Cranberry Champagne Punch is the one for you. It’s got all my favorite flavors in there, plus champagne and vodka. I’m not going to lie: when I look at those cranberries soaking in that punch I’m brought back to the 2016 Friendsgiving Fiasco where I made a cranberry margarita with tons of tequila. I had a few sips but don’t love tequila, so I poured it out and drank wine instead…but left the tequila soaked cranberries in my glass. Tip: never do that. Never ever ever. Now, I’ve had people tell me that Champagne Punch with vodka is a guaranteed hangover, but I don’t agree. I think it’s like everything else: moderation. But be careful, when punch tastes like juice you have to watch yourself! I love making champagne cocktails. There’s just something about adding a bottle of bubbly to a punchbowl that makes me happy. Champagne punch is something I make every holiday season. This year, I’m only entertaining a few times, and this easy punch will be on the menu at least once. When I was thinking about new things to mix with bubbly, cranberry obviously came to mind. But so did pineapple, because I love pineapple and champagne together. I think adding a bit of pineapple juice to any cocktail recipe just adds some extra depth of flavor. In fact, when I make myself a cocktail at night, I like to do vodka sodas with a splash of pineapple instead of cranberry now. I love the flavor it adds! 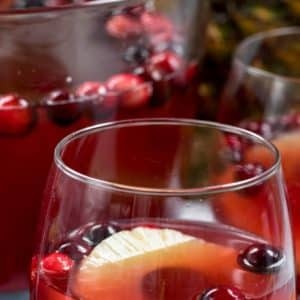 Cranberry Champagne Punch is the best punch cocktail to serve all during the holiday season! I guess you could also call this a Champagne Sangria. Sangria and punch are very similar: they have a bottle of wine mixed with fruit and juice and some sort of hard liquor. As with any cocktail recipe, you can adjust the alcohol content to suit your needs. I tried to make the ratio of juice to alcohol just perfect, but it’s fine if you want to tinker with it. Want it stronger? Add more vodka. Want it weaker? Add more cranberry juice. It’s easy to play around with it…and it gives you a reason to taste test. If you’re making this for a party and don’t want to serve it in a punch bowl, you can make it in a pitcher for sure. Or, just mix the juices with the vodka and triple sec, then add the champagne as you’re serving it. That way you can be sure the bubbles stay, well, bubbly. 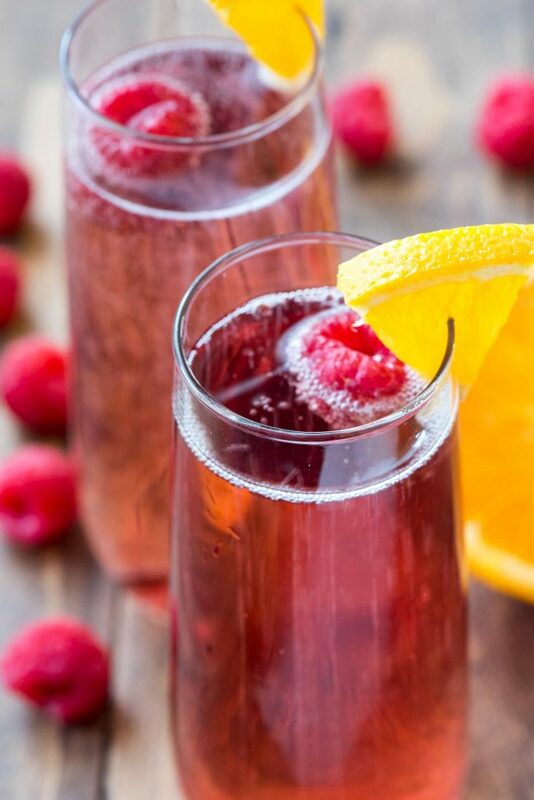 Be sure to make this champagne punch for a crowd; it packs a punch! With a full bottle of champagne, a cup of vodka and a cup of triple sec, it’s powerful. It’s my favorite new Christmas punch! Use a champagne you love. I prefer a less-sweet champagne (Brut) or even prosecco. Cranberry vodka would be fantastic in this. Instead of buying a large can of pineapple juice, I suggest buying the pack of mini cans. Then you won’t waste any. 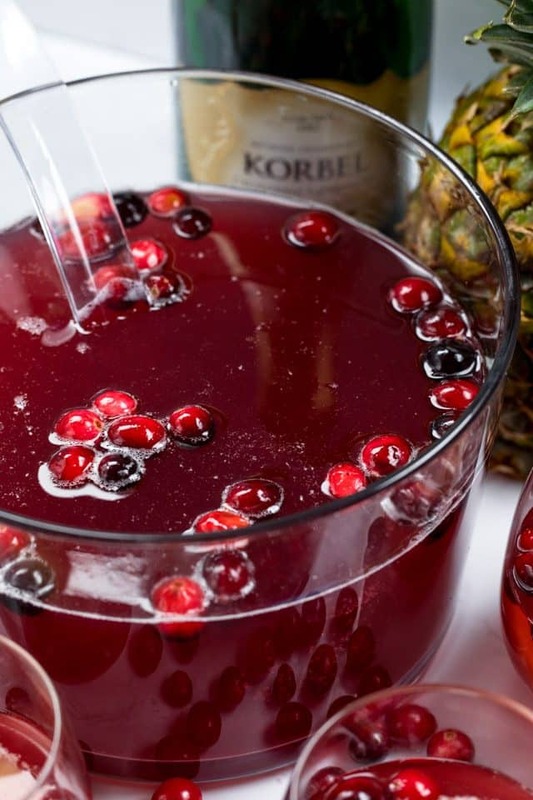 Keep your punch cold by freezing cranberry and pineapple juice ice cubes to float in your punchbowl! 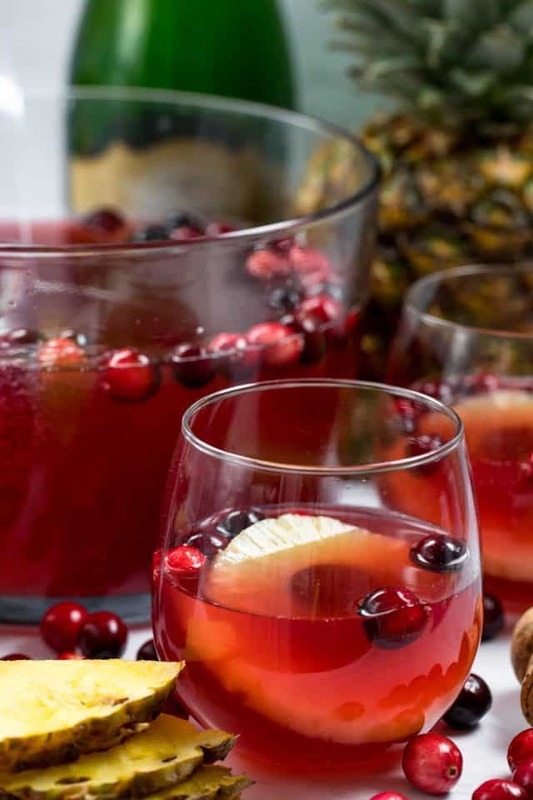 Cranberry Champagne Punch is the perfect holiday drink! 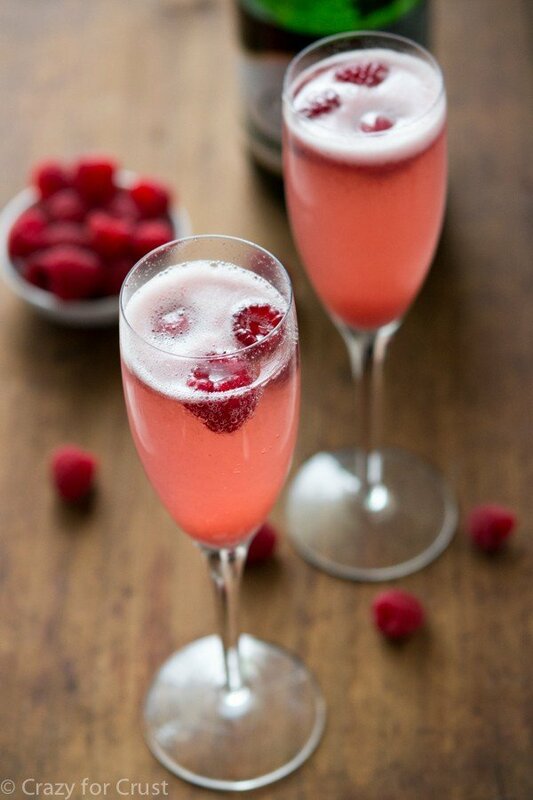 Champagne with cranberry, pineapple, and vodka makes a punch that tastes like juice. Stir all ingredients in a large pitcher or punch bowl. Garnish with cranberries and pineapple slices, optional. Serve as soon as you add the champagne. To make ahead: mix all but the champagne and add that at the last minute. This is beautiful, right up my alley, and I know I would not get a hangover from this Lol.